Ams has launched the AS7026, an optical sensor for continuous cardiovascular health monitoring which performs blood pressure measurement to medical-grade1 accuracy. The AS7026 provides continuous heart rate, heart rate variability, blood pressure, and electrocardiography (ECG) measurements when embedded in a consumer device such as a fitness-monitoring wristband or smart watch. The combination of advanced optical semiconductor technology and sophisticated algorithms boosts accuracy in wearable devices. The blood pressure measurement accuracy of the algorithm that the AS7026 runs is rated as medical-grade1 (grade B) when tested according to the IEEE 1708-2014 industry standard. 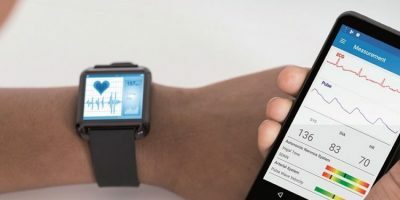 The high accuracy of the sensor’s cardiovascular measurements creates new potential for consumer and lifestyle devices such as smart watches to provide valuable health-monitoring data 24/7 that would normally require the use of dedicated medical equipment, often only available in a hospital or doctor’s surgery. Consuming little power, and packaged as a complete 6.2mm x 2.8mm x 1.0mm optical module, the Ams’ AS7026 enables life-saving smart health monitoring to be performed 24/7 by battery-powered devices. The small size of the sensor provides scope to develop innovative new applications for health monitoring technology – from in-ear devices such as earphones and hearing aids to toilet seats. The AS7026 features a high-performance optical stack which offers high sensitivity, low noise and high rejection of ambient light. This reduces power consumption, beneficial owing to the small size of the battery in wearable and mobile devices. Ams’ says the AS7026’s high performance is demonstrated in its VivaVita mobile reference design. This is a production-ready, 5cm x 5cm mobile accessory shows the full range of the sensor’s capabilities, including heart rate measurement, photoplethysmographs, ECG, blood pressure measurement and vagal tone measurement.